Companion Group provided the review & giveaway unit for an honest review. One of our big plans for the backyard is to build an outdoor pizza oven ourselves. It will be quite the project, possibly one that will require marital counseling in the end. Neither Scott nor I have ever done any brickwork before and the exact location of this pizza oven is still in debate. In the meantime, we’re using the kitchen-friendly Pizzeria Pronto Stovetop Pizza Oven by Companion Group, the makers of Charcoal Companion products, and my favorite Pit Mitt oven glove. 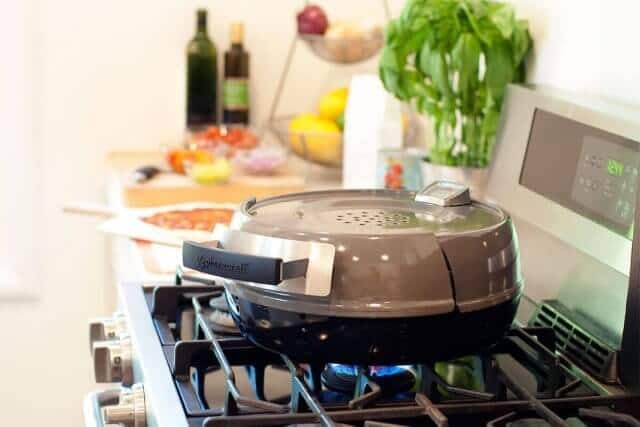 The Pizzeria Pronto Stovetop Pizza Oven is made for indoor gas stovetops, and is currently available exclusively at Williams Sonoma until February 2016. 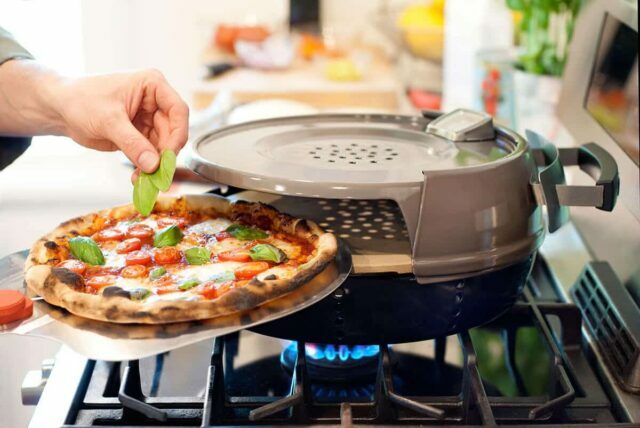 The Stovetop Pizza Oven can heat up to 600ºF in about 15 minutes, and cook your pizza in as little as 6 minutes. Included is a pizza stone. Use the handle to rotate the side opening to the right. Insert your pizza and rotate to close back up to create an enclosed baking oven. 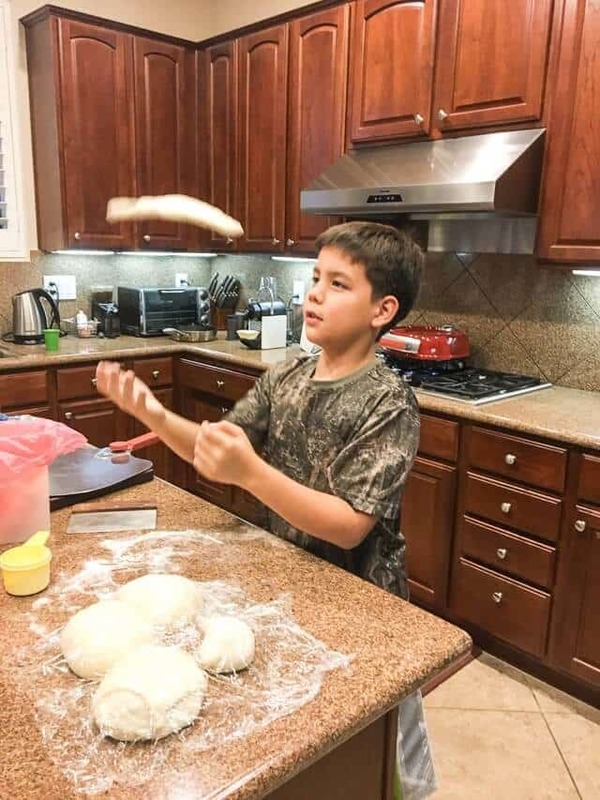 Nathan is my dough-throwing maestro – easily twirling and tossing the dough into a thin, round-ish shape. 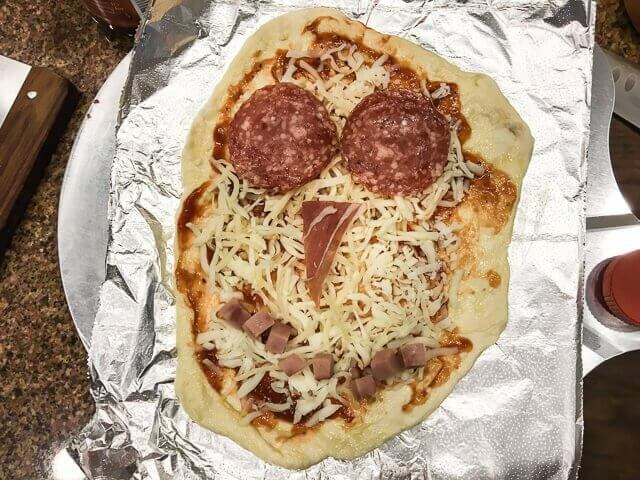 The kids had a great time designing their own pizzas – salami eyes, proscuitto nose and ham smiles. Scott is the pizza baking chef – I tend to get distracted and lose track of time when making garlic breads and pizzas. He’s more meticulous – AND – he just got a brand new Apple Watch which conveniently buzzes him when time’s up. So, he was in charge. We didn’t have to go outside! It’s cold right now in the evenings outside and all of our pizza making happened in our warm kitchen. 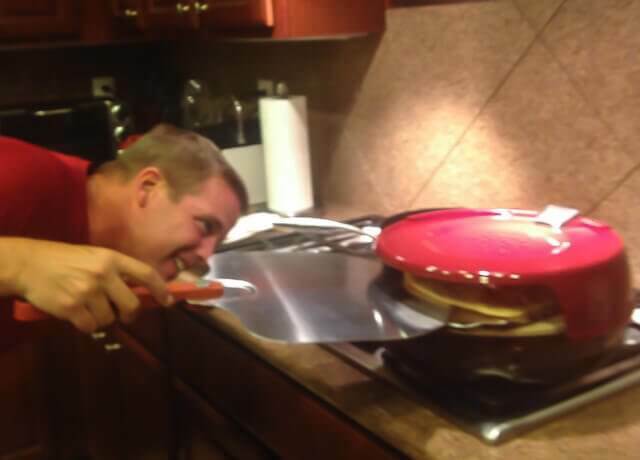 Everyone gets involved in making their own pizza and watching it bake. It’s easy to use. Just turn on your gas stovetop. Easy to store (fits back into the box and on a shelf in the pantry. Easy to clean. Because the Pizza Oven is a small, enclosed space, the top of the pizza cooks evenly. Love the built in thermometer. For $179, I think it’s a little pricey. It’s a big ticket gift item. I would have loved to see the price at ~$120. The instructions state not to turn up the stovetop heat too high (we have an 18,000 BTU stove), otherwise discoloring could happen on the stainless steel portion of the stove from the intense heat of the Pizza Oven. We were a little nervous about that (it’s my Mom’s really nice stovetop!) – but medium-high heat didn’t produce enough heat to get the oven to 600F. The highest temperature we registered was 550F. The bottom of the pizza did get a light brown crust. Our pizza took 9-10 minutes (instead of 6 minutes as the instructions stated.) We would have liked a crisper crust. But the pizza bottom did heat very evenly – the crust was even throughout. We got a few nice “blisters” on top of the pizza, but couldn’t get it to look like the very first picture in this post. 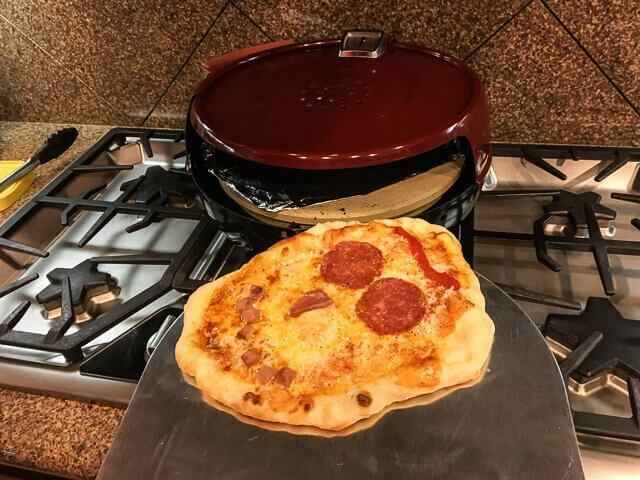 If you’re a pizza lover, and don’t always get great results with using your oven, this is a great oven for family pizza night. The entire family had a fun time making their own pizzas. While we made our own homemade dough, many grocery stores sell ready-to-use dough that would make last-minute pizza nights do-able. While one pizza bakes, start making the next. That way, you’ll have a hot pizza every 6-10 minutes, ready to eat. We fed 2 adults and 2 kids – it was perfect. If you have a larger party, consider having other ready-to-eat food on the table while each pizza bakes. I think the Pizzeria Pizza Oven works best with a larger stovetop with high BTU’s. If your stove is very small, and has low BTU’s, it will take longer to heat up – and the heat source is more concentrated in the middle of the Pizza Oven, and you’ll really have to rely on the efficiency of the stone to radiate heat throughout the stone – to brown the edges of the crust. As you are rolling out your dough (or tossing it like Nathan), make sure you get the dough as thin as you can. Thick dough will not cook as well in this oven – though it is doable – just cook the crust first for a few minutes, then add toppings and finish cooking. The Pizzeria Pronto Stovetop Pizza Oven is exclusively available at Williams Sonoma in steel color for $179.95 until sometime next year. 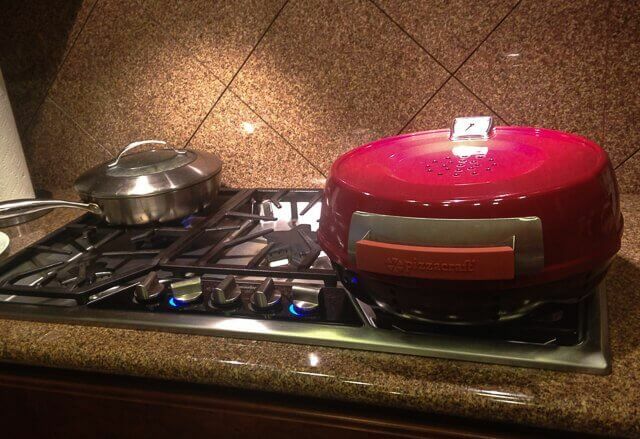 Giving away one Pizzeria Pronto Stovetop Pizza Oven!